On May 3rd, 1887 ,shortly before 6:00 p.m. in the south slope of No. 1 Pit Mine at the “Esplanade”, someone fired a poorly placed explosive into the rock face. An undetected cloud of gas ignited and an explosion occurred which ultimately killed 150 miners, left 46 women without husbands and 126 children without fathers. At that time, the total population of Nanaimo was close to 4,000. 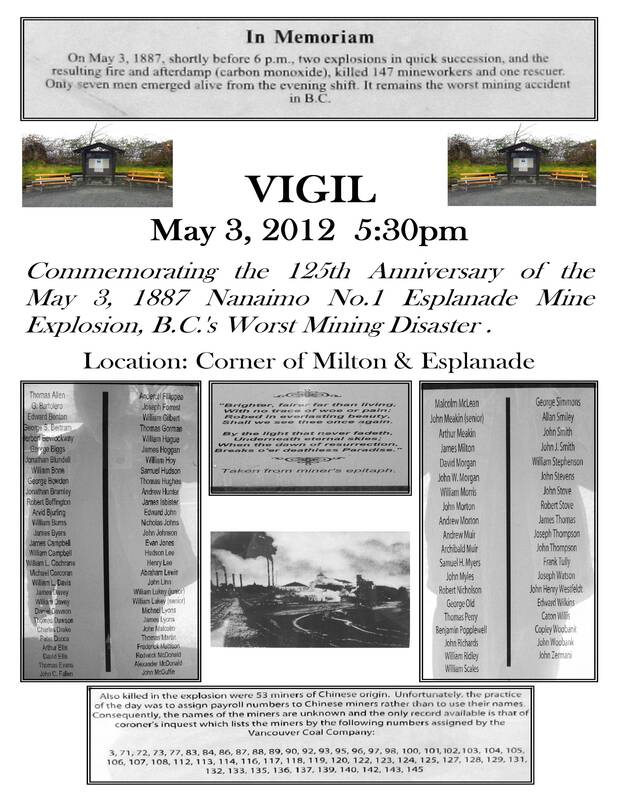 On Thursday May 3rd, 2012, on the 125th Anniversary of the disaster, the South End Community Association will be planting a rose garden in memory of the Nanaimo citizens lost and their families. This commemorative event will take place at the Miner’s Kiosk, at the corner or Milton Street and the Esplanade and will begin at 5:30 p.m. with the planting of the garden by SECA members and guests to begin at 6:00 p.m. Everyone welcome. Thanks to the Nanaimo Historical Society, Pamela Mar, Van-Kam Freightways Ltd. and Murial MacKay-Ross for their generous donations. At the site of the Miner’s Memorial Kiosk on Milton Street, Charles Torhjelm from SECA reviews plans for the Rose Garden. Looking on are, from left, Richard Coulthard and Darren Fargo, who will be preparing the site, and Gail Pasaluko, Horticultural Supervisor for the Parks, Recreation and Culture Department of the City of Nanaimo. 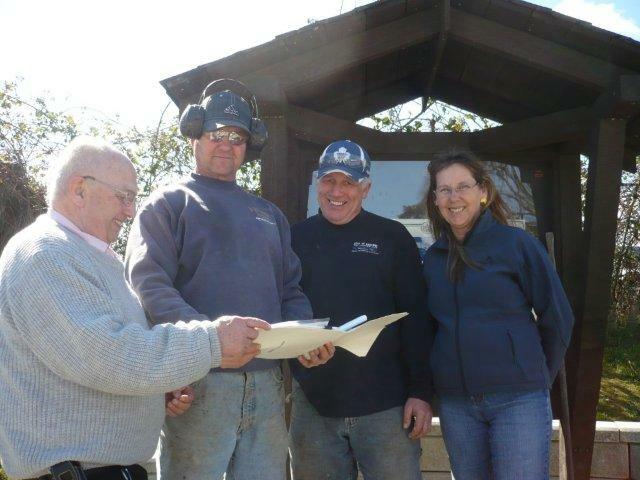 Sad new to pass along that Peter Presotto, long time SECA member, friend and neighbour passed away on April 23rd at NRGH at the age of 77. Peter hadn’t been well for the past couple of years and wasn’t able to participate in SECA activities as much as he would have liked. Peter Presotto was a really lovely man and a wonderful south end citizen. He was a passionate supporter of our association and dedicated countless hours to supporting the association and participating in our efforts to strengthen and improve the neighborhood. He was an impeccable SECA Treasurer for many years, fund raised for the Miners Picnic for most of the past 20 years, (we call his list of donating businesses, “Peter’s List”), was instrumental in the development of the Chase River Estuary Park, (we’ll be thinking of Peter tomorrow at our annual Estuary Park Day), turned up for all the meetings and events and generally helped out in any way he could. If you wanted to describe a model member of a local community association, Peter Presotto would be as good an example as you could find. Our love and very best wishes to Peter’s wife Vilma. Peter’s funeral will be held at St Peter’s church, Fitzwilliam Street on Monday, April 30, at 10.30am. Charles Torhjelm sits in the living room of his south-Nanaimo home, surrounded by pictures, posters and newspaper clippers from the past 20 years. The items represent two decades of passion-driven work by Torhjelm, former president of the South End Community Association, to promote the south end in a positive light. Click on headline link to go to the rest of the article. It’s the spring event of the season in the South End! 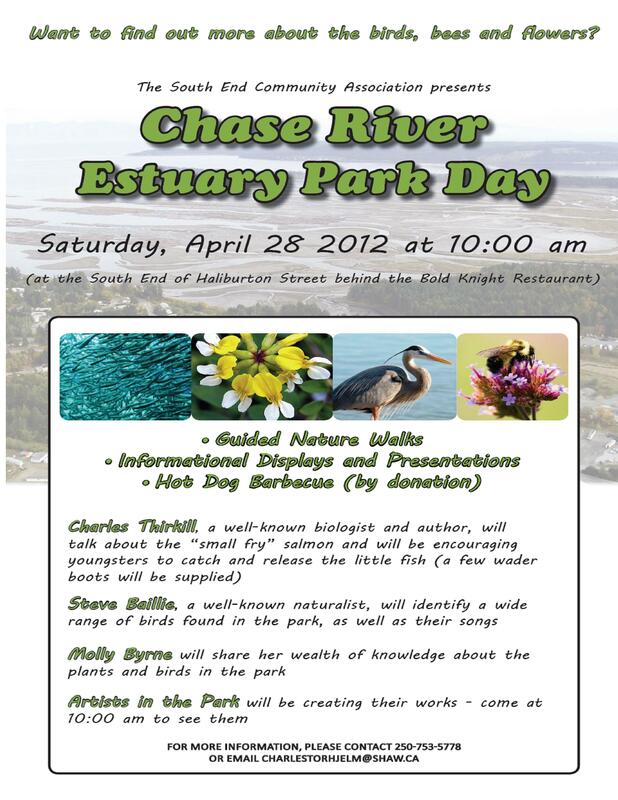 Chase River Estuary Park Day, April 28, 10:00 am to about 1:00 or so. Steve Baillie, a well known naturalist will be our guide as – – It’s Bird Romance Time. Some do it on the Water. Some do it in the trees. Some do it on the ground and some on the telephone poles. A terrific event for families of ALL ages! A 45-year-old Nanaimo man is in police custody after a knife fight at the old Balmoral Hotel on Friday night. Move that South End Neighbourhood Association asks Chris Sholberg calls the annual meeting of the Community Plan Steering Committee within the next four weeks. 2.Amend the Development Permit Area 9 guidelines contained in Section 7.4. of the OCP to include the South End Urban Design Guidelines. Section 6.2. SECA will work on this idea. Also Fall Fair concept. No action yet. Likely a city wide initiative. Subject to view street park development concept – interest shown by City Parks Dept. SECA will evaluate – started with YPN project on Irwin Street. Provincial Government has evaluated and noted support for implementation in near term – subject to budget approval – Province would like to cost share with City. near the intersection of Esplanade/Victoria Crescent with the Island Highway. No action yet. Likely will need City-wide initiative. Already in process through SECA annual cleanup efforts. City will continue to support at SECA request. SECA will circulate program brochure and look for members to take this on. Brochure will be developed by SECA with City assistance and then distributed. creates voluntary external repaint initiative for residences and businesses located along the eastern side of Nicol Street, with priority given to the section between Milton and Farquhar Streets. SECA will pursue through beautification initiative with support of City. No action yet. Consider banners designed by local South End artists. a mechanism for the City to facilitate property acquisition and use. SECA will identify possible lane names for City consideration. Good Neighbour Agreements currently required for all pubs/lounges/night clubs. Will look at agreement format that requires ongoing relationship between business operator and SECA. No action yet. SECA has proposed custom designed notice board at Irwin Street cul-de-sac near Gino Sedola memorial tree. No action yet. City Parks Department interested in this idea. No action yet. Consider partnership with VIU students as Public Health project. SECA, with City support, will continue to initiate periodic boulevard tree planting events. SECA, with City support, will identify ideas and opportunities for projects. SECA will look to carry out survey in 2013, and every 3 years thereafter. Done, as part of City-wide initiative. SECA, with City support, will look at initiating a neighbourhood based mapping process. No action yet. Data is being collected by the Ministry of Environment with respect to air quality city wide. Various city-wide initiatives to lessen air pollution currently underway (e.g. wood stove change out and Burn It Smart) . No action yet. Sustainability Action Plan likely to be adopted by City Council in 2012. Not an issue at this time. Will employ when issues arise regarding a specific property. Baseline inventory and mapping has not yet been done. City continues to offer programs – looking at accelerating use of programs in South End. City working in partnership with Ministry of Environment on City-wide air quality analysis. City will promote program in area with SECA help. City will work with SECA to bring opportunities for lectures/sessions to neighbourhood. Partial action. Residential density bonusing allowed under new Zoning Bylaw, and a number of areas in the South End were up zoned to encourage higher intensity of commercial/residential development. Still need to look at DCC expansion and Revitalization Tax Exemption area ideas. Cash grant per residential unit created on the site. Partial action. City currently working with Province on policy and actions which would encourage Brownfield redevelopment. Design workshop recently held to test barriers to redevelopment of gas station sties – two gas station sites on Nicol Street examined in this process. Province would like to help Cities in B.C. development local redevelopment incentives to supplement Provincial incentives. SECA will consider initiating – need champion – someone who will instigate and manage. Shaded items imply completed or inactive action. Spring is in the air and we’re looking forward togetting out on site (when it’s not raining or snowing..). We have plots available for lease – $30 for the year – please email us at gardens@ypnanaimo.com to make arrangements. Everyone welcome to join, so tell your neighbours and friends! Also please mark your calendars for the following Vounteer Days where we will be following our planting schedule for the foodbank plots. As the maintenance of these plots are all done by volunteers we hope to see you out – even if you only have a few miuntes, we would love to see you! The Volunteer Days are also it’s a chance to help share your gardening expertise with the other gardeners – or learn from other gardeners! Wedneday April 4th – 4pm THIS WEEK! Finally, If you haven’t checked out the Turner Rd garden yet and want to see how it’s progressing, please come by during the North Garden Open House Friday April 13th 3-5pm – bring a non-perishable food item for donation to the foodbank, come help plant the foodbank plots and get to meet some fellow gardeners!